Electric vehicles cost more than conventional cars. It’s a scientific fact, as Homer Simpson might say. But is it true? Consolidated Edison and National Grid have both enlisted the aid of Enervee, a Los Angeles company that invokes “data-science, behavioral science, and digital marketing” to help utilities steer their customers toward the purchase of energy-efficient appliances. 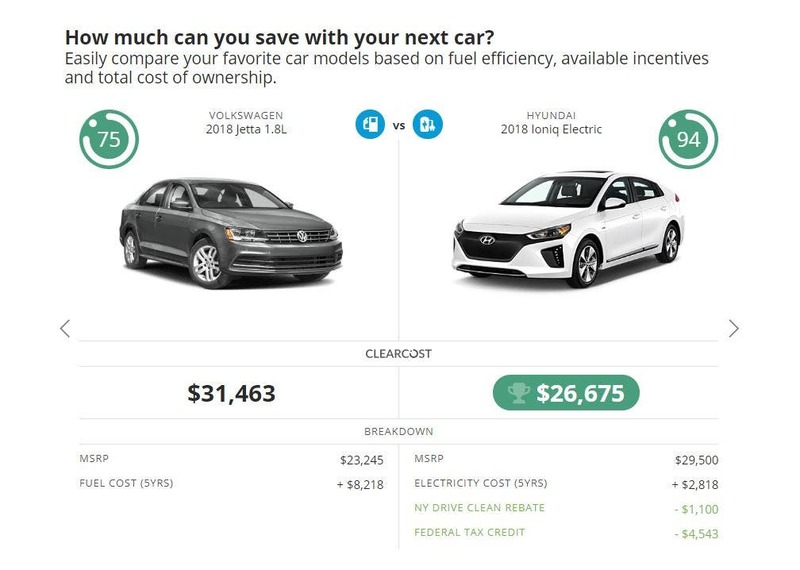 Now it has applied its skills to create a website for both utilities that compares the cost of purchasing an electric car directly to the cost of purchasing a similar vehicle with an internal combustion engine. Enervee’s calculator rates just about every car sold in America, determines the base sales price, calculates the cost of fuel or electricity over time, figures in any federal, state, and local rebates available, and arrives at the bottom line, which it calls its “clearcost.” It also assigns an efficiency rating for each vehicle. The result? In many cases, the EV actually turns out to cost less to own then the gasmobile, as reported by Greentech Media. For instance, a Volkswagen Jetta with the 1.8 liter engine lists for $31,463. The clearcost of a Hyundai Ioniq Electric? $26,675. But wait, you say, the Jetta lists for $23,245 and the Ioniq lists for $29,500. How can the Hyundai cost less? Simple. The Jetta will use an estimated $8,218 in fuel over five years. The Ioniq will consume about $2,818 in electricity over the same period of time. Also, the Ioniq is eligible for a federal tax credit of $4,543 and a New York State Drive Clean rebate of $1,100. The net result is the Hyundai will cost almost $5,000 less to own. Want another example? Consider a Tesla Model X. This car costs $14,000 more than a Lincoln Navigator but ends up costing more about $3,000 less over five years when all is said and done. Part of that is the $11,744 in fuel costs the Lincoln will incur over 5 years versus $4,078 worth of electricity for the Tesla. Add in the full $7,500 federal tax credit (if still available) and the New York rebate of $2,000, and the electric car actually will cost the owner less over time. Now, are some of these estimates a bit fluid? Yes, of course. Electricity rates vary across the country; tax credits and rebates may come and go; gasoline prices could go rise or fall. None of these factors are certain. However, what this indicates is that both utility companies are looking at demand for electricity that is either flat or falling and wondering how electrified vehicles might improve their business model. The cost comparison websites are identical for both companies except for the logo at the top of the home page. It’s possible other utilities might elect to get together with Enervee to help boost EV ownership among their own customers. 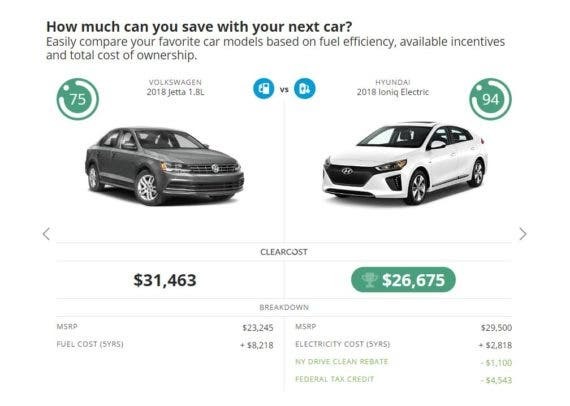 So now when someone tells you that EVs cost more than conventional cars you have a way to show them online how that perception is simply no longer valid. Sure, the utility companies are doing this in the hopes it will boost their bottom line, but anything that helps promote the EV revolution is welcome news indeed.